Don’t be fooled by the famous pop culture images of cats lapping up milk. It turns out that cow’s milk isn’t actually all that good for cats. In fact, cats are more or less lactose intolerant because their digestive systems aren’t able to produce enough enzymes to properly digest cow’s milk. But does that lactose sensitivity extend to cheese? Can cats eat cheese? Can cats eat cheese? Photography © Okssi68 | iStock / Getty Images Plus. Jenna Mahan, Director of Claims for Embrace Pet Insurance, says that — in small amounts — cheese made from plain cow’s milk is safe for cats. Cheese isn’t a healthy part of a cat’s diet … but it’s also not a dangerous treat. So, why isn’t cheese healthy for cats? Think back to the aforementioned lactose sensitivity. Most cheese has cow’s milk and cow’s milk is hard for kitties to digest. “Cats become lactose intolerant after weaning, so any rich dairy, such as cheese, should be offered only sparingly,” cautions Emmy award-winning veterinarian, Dr. Jeff Werber. Can cats eat cheese that’s not made from cow’s milk? But can cats eat cheese that’s made from something other than cow’s milk? Goat’s milk is a bit easier for cats to digest, so goat cheese is a slightly better snack option for your cat. 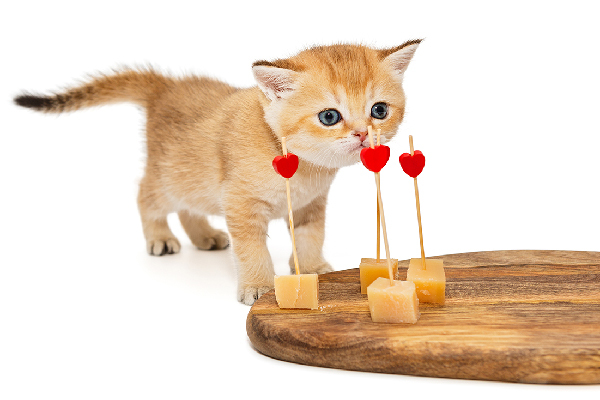 Can cats eat cheese — as a treat? So, can cats eat cheese — even in small amounts, maybe as a treat? Small amounts of cheese are safe for cats and might be useful if you need your cat to do something she doesn’t like to do, like take medicine. Always consult with your veterinarian before feeding your cat cheese in this manner, but with most cats you can hide a pill in a small amount of cheese. What cheeses should cats not eat? So, the answer to, “Can cats eat cheese?” seems to be that it’s safe to share a little bit of cheese with your cat on occasion. But are there types of cheeses you shouldn’t share with your cat? Jenna says that cat parents should avoid feeding their cats blue cheese. The good thing is that blue cheese is a type of cheese that isn’t likely to attract most cats. In addition, Dr. Werber says that sticking with the simplest cheeses are best. The richer the cheese, the more you should avoid sharing it with your cat, he advises. Quantity is also a big concern when it comes to giving cheese to your cats. If you give your cat cheese, only give your cat a very small amount. What are the side effects of cats eating cheese? “Since cheese contains lactose it may affect some cats with noxious side effects, mainly gas and diarrhea,” explains Jenna. Because cats are lactose intolerant, some cats will experience dietary upset with cheese. My youngest cat loves the occasional cheese snack and thankfully has never had any dietary upsets from cheese. If your cat shows any signs of sickness after eating just a bit of cheese, try another snack instead. Thumbnail: Photography © ElenaBoronina | iStock / Getty Images Plus. Sassafras Lowrey is an award-winning author whose novels have been honored by the American Library Association and the Lambda Literary Foundation. Sassafras is a Certified Trick Dog Instructor who shares her home and writing life with three dogs, two bossy senior cats and a formerly feral kitten. Learn more at .